Couldn't come up with a better plan for the brief day-and-half window of clear weather forecast for Wednesday into Thursday morning, so I decided to head for Rainier -- back on home snow for the first time in 3 weeks, after spending most of the previous 2 weeks skiing in Oregon and California (some of those TRs are partially written, may be posted soon). 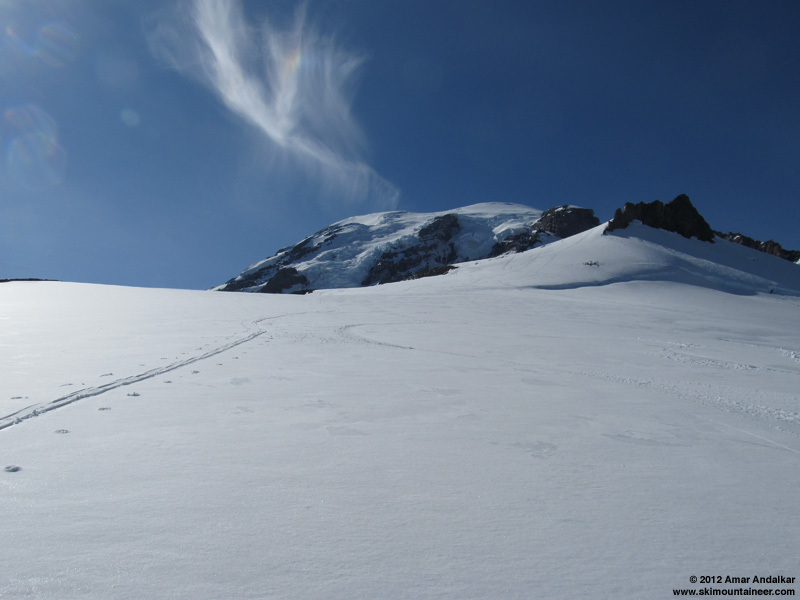 Skied 2 very different routes down Paradise Glacier from Camp Muir on Wednesday evening and Thursday mid-day, the second of which was almost entirely new to me: Paradise Glacier edge past McClure Rock down into Edith Creek Basin via an interesting snow-ridge-filled gully). Very cool to explore and discover new ground in complete solitude on a sunny summer day, smack in the middle of someplace that I've skied over 150 times before (Muir + Paradise Glacier). An excellent 24 hours with about 10600 vert of total ski ascent and descent, some fine skiing too, mostly on good to great smooth snow conditions. 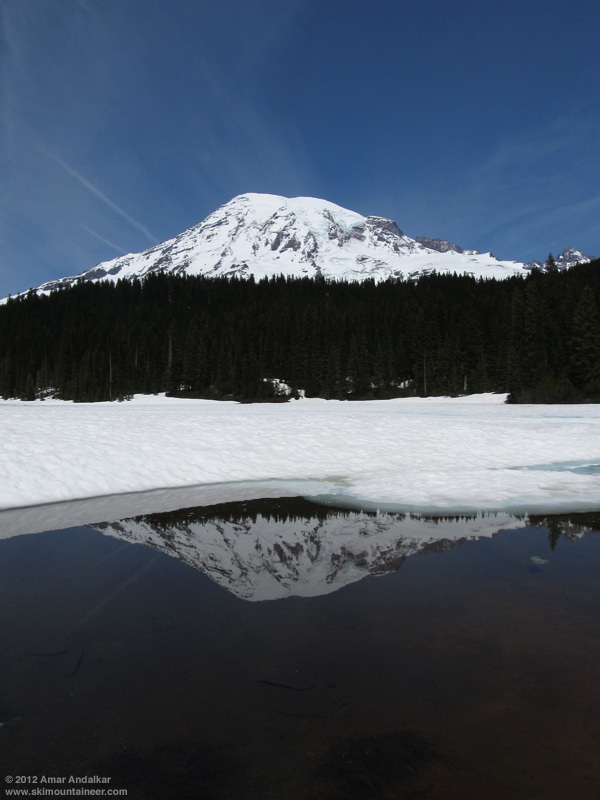 Got a late start from home Wednesday morning, and took the scenic route to Paradise via Cayuse Pass, a side trip to Chinook Pass (still 5-10 ft of roadside snow, saw several skiers), Stevens Canyon Road (annoying this summer, long construction delays of 20-30 minutes), and the mostly-frozen Reflection Lakes. 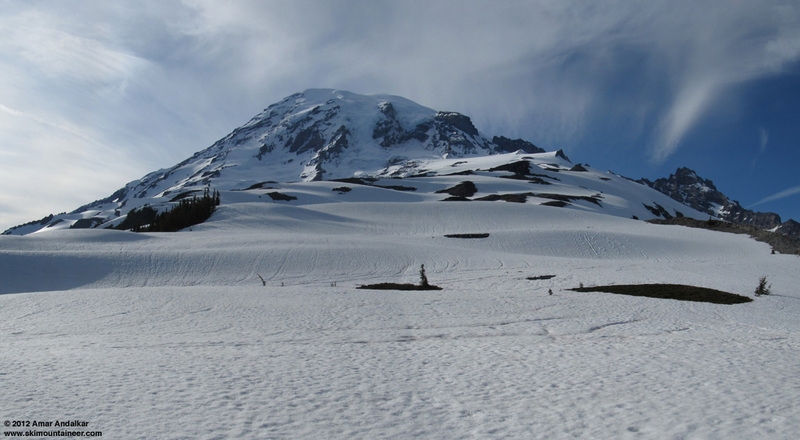 Overview of Muir Snowfield and Paradise Glacier from Stevens Canyon Road. The main Paradise parking lot was "full" (although about 1/3 of the spots were blocked off by cones) and the Paradise Valley Road was frustratingly closed, so I was forced to park in the old visitor center lot. Skinned up after 1:30pm starting at the top of the stairs only a few yards from the car. Followed a faint skin track up Pan Face on all snow except a few yards of bare trail at the top (no vegetation stomping needed). Going around to the right, snow remained continuous to Pebble Creek except for another short discontinuity in the usual bare spot near 7000 ft, also easily crossed on skins across bare rock and dirt. The only all-snow skinning routes from Paradise to Muir are now apparently via Edith Creek Basin and Paradise Glacier. Crossed an unusual channel eroded into the snowpack at Pebble Creek, with traces of new snow here at 7200 ft. There were increasing amounts of recent new snow above that, about 1-2" near 8000 ft growing to 6+" above 9000 ft. By mid-afternoon on this sunny day, the snow from 7000-8000 ft was corn especially where the new snow had not stuck, then a thin layer of new proto-corn above 8000 ft, but above 9000 ft it was just dense, somewhat damp, windpacked powder, not even pre-proto-corn yet. Tried to follow portions of a previous skin track, but found that I had better traction and less glopping if I just broke my own trail. 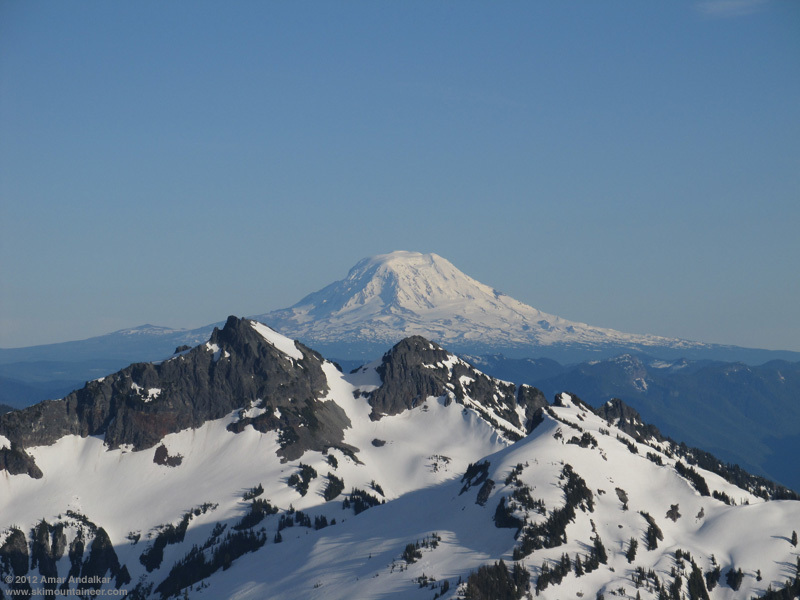 Reached Camp Muir just before 5pm in a moderate SW breeze, checked for any news at the climbing ranger hut, and then skied down, angling left towards Anvil Rock and Paradise Glacier. 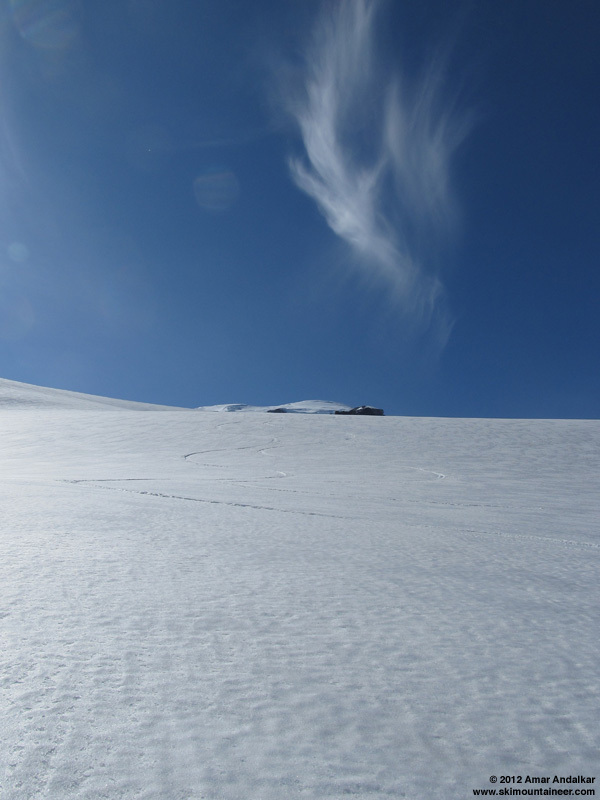 Dense windpacked powder up high, but transitioning to re-firming proto-corn and corn on the steep face beside Anvil and on the Paradise Glacier. 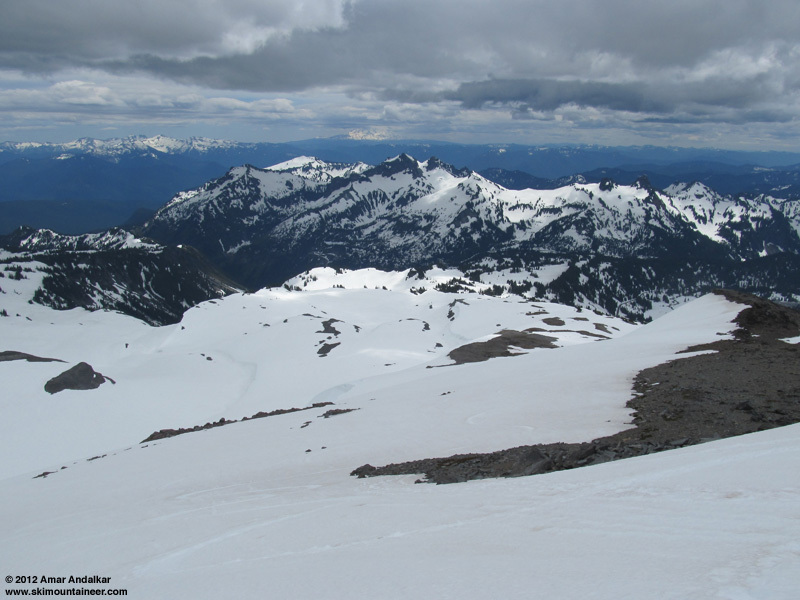 Followed the standard SE-trending fall line towards Cowlitz Rocks, the bergschrund near 9000 ft is partially open and big crevasse near 8000 ft is also starting to show itself. Excellent smooth fast snow conditions at 5:30pm, with only a single skin track and ski track from earlier in the day (plus faint traces of older ski tracks) on the entire expanse of the glacier. Lots of ice worms out on the glacier surface. Smooth snow, solitude, and lovely evening light. 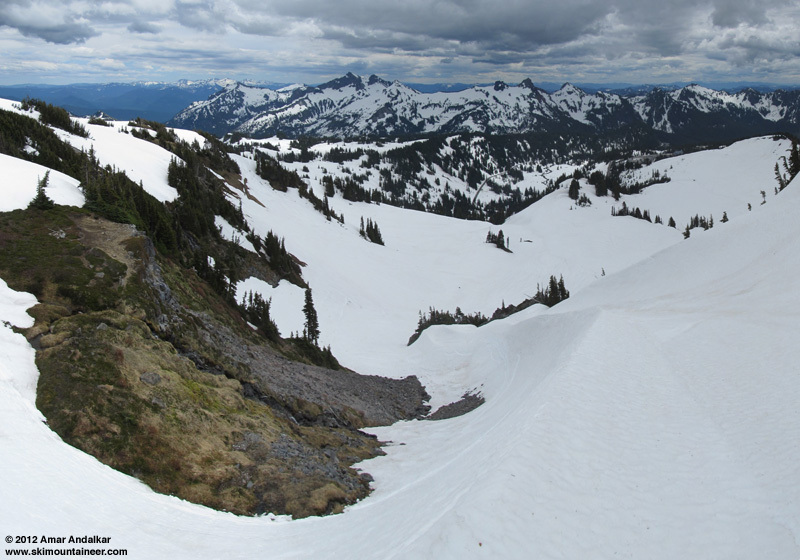 Descended and traversed through the basin of the former lower Paradise Glacier and down the rightmost gully (which as expected had a scary hole in the snowpack near a small waterfall) to the Skyline Trail bridge at 6000 ft, which is just starting to melt out of the snow. Since my car was way over at the far end of the Paradise lots, I decided to skin back up roughly along the trail's route past Golden Gate and up to the top of Panorama Point at 7000 ft, which would give me a nice fall-line descent back to the car. It was a route which I'd never skinned before, and had the unexpected bonus of spying a very interesting gully, descending through the cliffs near 6400 ft into Edith Creek Basin and filled with an unusual sharp snow ridge, curving in a vertical arc up the gully beside a small waterfall. A few recent ski tracks marked this spot, which somehow I had never skied before (or don't recall if I have). 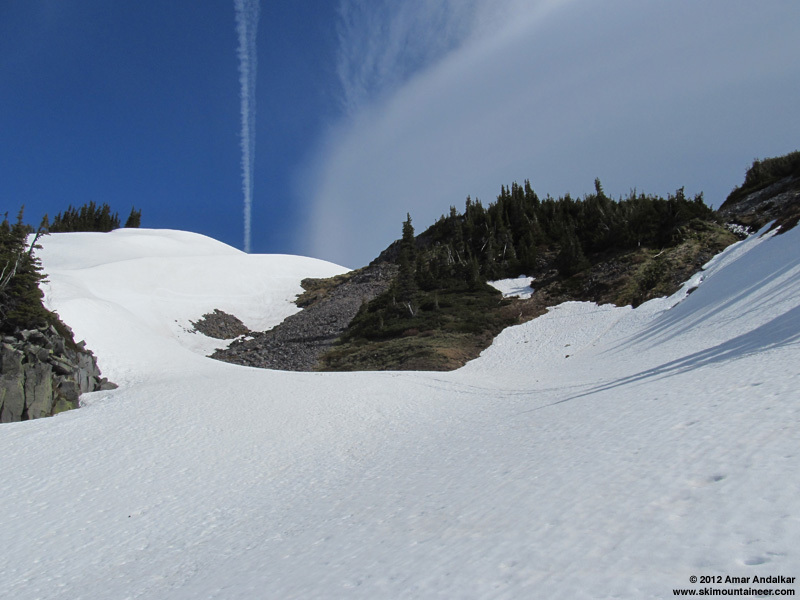 Perhaps a ski route for the next day? Panoramic view of the upper Edith Creek drainage above Golden Gate. Skinned up mushy semi-consolidated snow in the upper Edith Creek drainage, and arrived leisurely above Pan Point around 7:30pm. A quick cruise down the SW ridge of Pan Point, some tight turns down the short steep south face, and then a long schuss out via Deadhorse Creek Trail back to the car. Snow conditions were nice and quick in the late evening, especially by staying on shaded slopes. Spent the evening sightseeing in the moonlight and hanging out at Paradise Inn. By 11pm, a lenticular cloud was building on the summit, and by midnight it had grown large enough to engulf the uppermost mountain. 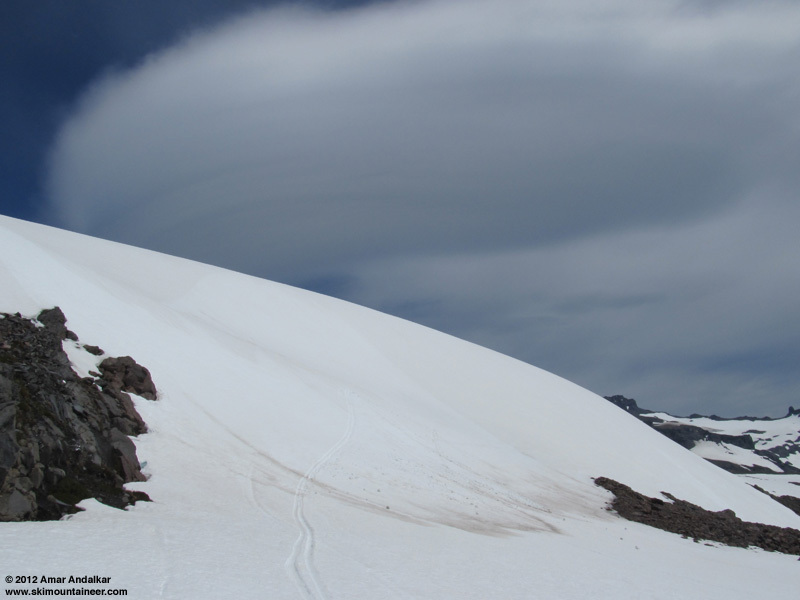 But by dawn at 5am, the lenticular was gone, although soon an immense lee wave cloud (several times the diameter of the mountain) was building just above and east of the summit, blocking the morning sunshine from the Muir Snowfield and Paradise Glacier. 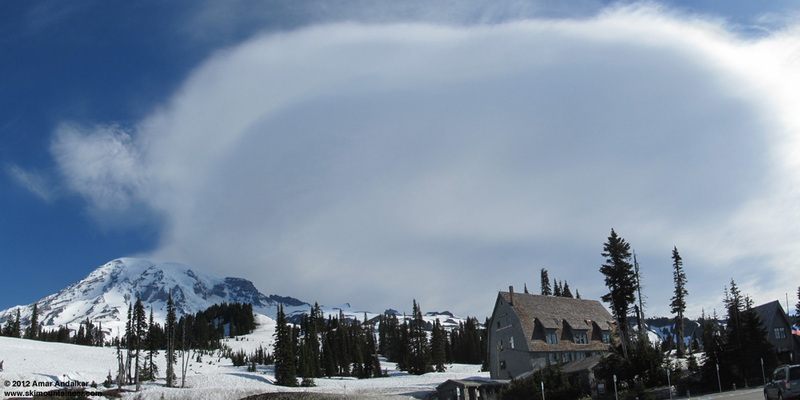 Panoramic view of the immense lee wave cloud east of the summit of Rainier. 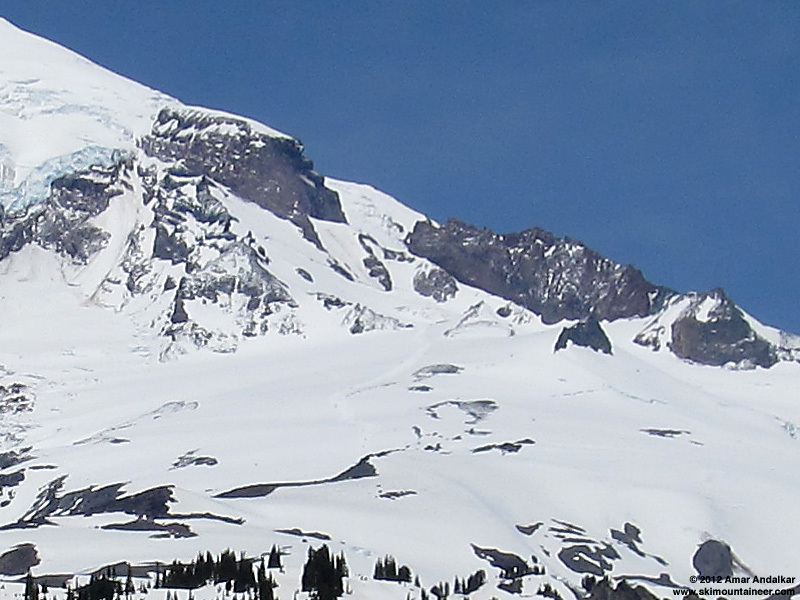 With clear skies overnight outside the lenticular, I expected a hard freeze of the snowpack, and delayed softening in the morning due to the lee wave cloud. So a very leisurely start had me skinning from Paradise (the main lot) towards Edith Creek Basin just before 9am, perhaps an hour later than I really wanted. Arrived at 6200 ft at the base of the gully that I had spied the previous evening, and decided to try to skin up that instead of the usual trail slope to Golden Gate. Luckily the sun had been on the very steep snow ridge in the gully (SE aspect) for at least an hour, and it was well-softened enough to be skinnable but not to slide, although I did sidestep about 10 vertical feet of the steepest part. Sketchy almost-extreme skinning up a scenic route, fun! The snow-ridge gully, it's much steeper than it looks here. Above the gully, the upper Edith Creek drainage is a broad open bowl, and I angled NE towards the edge of Paradise Glacier just right of McClure Rock. Easily skinnable most of the way, but then the crux steep slope at 7200 ft was another story. About 35-40 degrees steep, with deep oversoftened mush on this SE aspect at 10:30am, sliding out unpredictably, slow and frustrating. This was not extreme skinning, it was a potential wet slide accident about to happen. Not worth the risk, so I carefully switched over, skied across out of the hazard and down about a hundred ft, then did a rising traverse to rejoin the standard route to Muir heading for Pebble Creek near 7100 ft. The steep slope that wasn't worth skinning, with lee wave cloud above. It was now well after 11am, the weather was still mostly sunny and beautiful, and I was finally making swift progress towards Muir. But soon the wispy tendrils of an incipient lenticular cloud began to embrace the upper mountain, joining the lee wave cloud still persisting to the east. Incipient lenticular at 11:40am, with lee wave cloud still present at right. 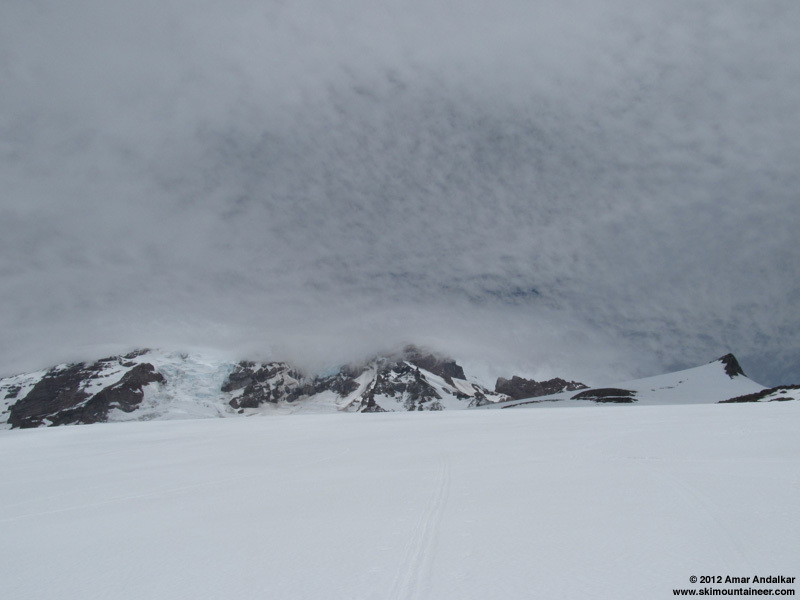 By noon, the upper Mountain above 12000 ft had vanished into the cloud, and it grew more ominous and menacing by the minute, while other building high clouds cast the Muir Snowfield into shadow. Above 9000 ft, a gusty SW wind was often hitting 30-40 mph, although temps were well above freezing and there were still a few sun breaks as the clouds streamed past the Mountain. So it was not particularly foul weather (yet). By noon, the summit was lost in the clouds, not to be seen again this day. 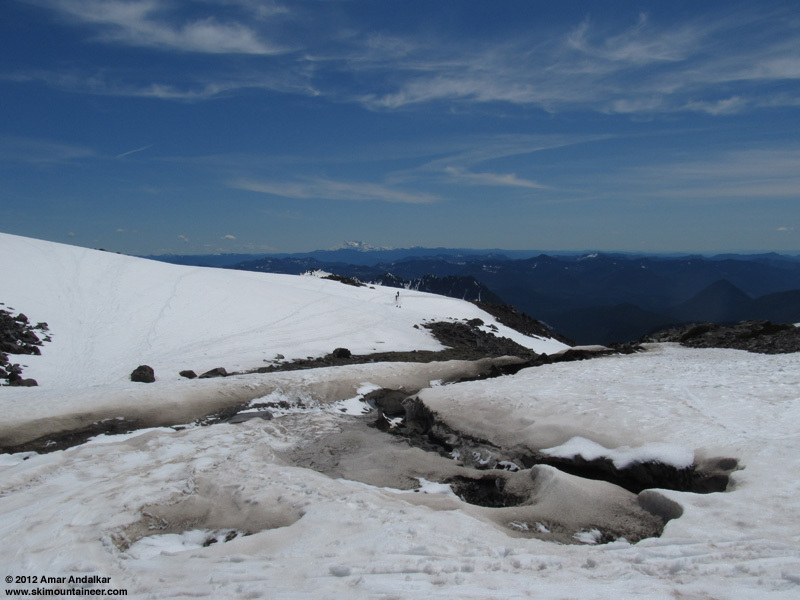 Arrived at Camp Muir just before 1pm, wishing for sure that I had started an hour earlier in the morning. Did a quick changeover out of the strong wind in the lee of the RMI shack, telemetry from the anemometer mounted on the far end of this same building showed winds gusting 60-70 mph (see below). Skied down towards Paradise Glacier once again, basically straightlining much of the upper part to maintain speed on the smooth wet snow in the face of a strong angled headwind. This time, instead of following the standard fall line SE down the glacier, I aimed south and stayed close to the west edge of the glacier. A flatter and more traversing route, down past McClure Rock and the spot that I had failed to skin up in the morning mush 3 hours earlier. 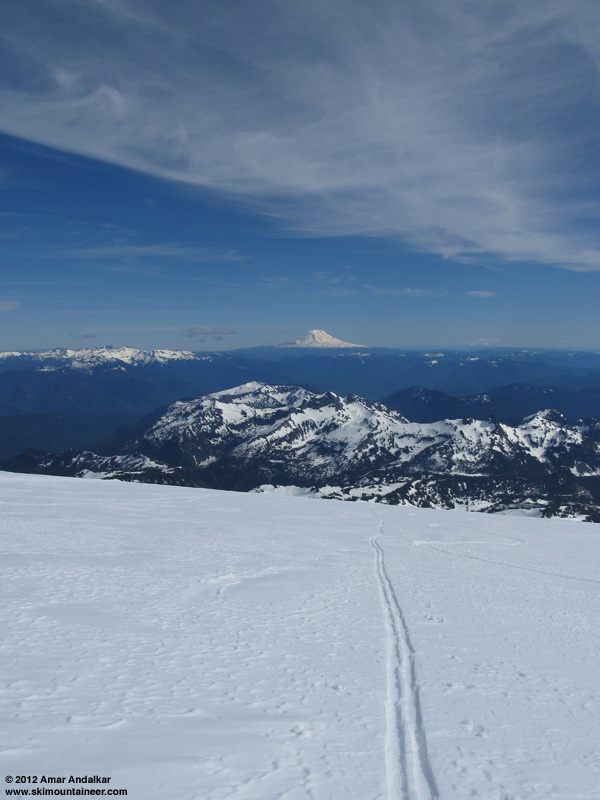 The steep slope slid as expected with a small wet slide as I ski cut across, but it was totally safe and harmless given the swift mobility of bare skis versus the slow vulnerability of climbing the same slope on skins. Panoramic view (from 4 vertical photos) looking down the snow-ridge gully into Edith Creek Basin. Back through the upper Edith Creek bowl, a mix of a few nice turns and long angling schusses, then down into the fun snow-ridge gully. Stable oversoftened corn on all that, fun skiing and no slides. Then a fairly quick exit angling down and traversing around Edith Creek Basin, back to the car at Paradise before 2pm. Glad to have squeezed in a second day of skiing just as the weather window definitively slammed shut. A few raindrops hit the windshield on the drive home to Seattle, and webcams showed rain by evening at the Paradise parking lot. SYNOPSIS...WEAK HIGH PRESSURE WILL PRODUCE DRY AND WARMER WEATHER TODAY. A WEAKENING WEATHER SYSTEM WILL ARRIVE LATE THURSDAY INTO FRIDAY MORNING. THE WEEKEND WILL REMAIN UNSETTLED WITH AN UPPER LEVEL TROUGH OFF THE COAST. WEDNESDAY...MOSTLY SUNNY. FREEZING LEVEL 9000 FEET. WEDNESDAY NIGHT...PARTLY CLOUDY. FREEZING LEVEL 10500 FEET. THURSDAY...MOSTLY SUNNY IN THE MORNING...THEN MOSTLY CLOUDY WITH A CHANCE OF RAIN AND SNOW LATE IN THE AFTERNOON. SNOW LEVEL 9500 FEET. THURSDAY NIGHT...MOSTLY CLOUDY WITH A CHANCE OF RAIN AND SNOW. SNOW LEVEL 9500 FEET. FRIDAY...MOSTLY CLOUDY WITH SCATTERED SHOWERS. SNOW LEVEL 9500 FEET. FRIDAY NIGHT THROUGH TUESDAY...MOSTLY CLOUDY WITH A CHANCE OF SHOWERS. SNOW LEVEL NEAR 9000 FEET. Thanks for sharing. I was on Interglacier on the 28th and was wondering what the weather was doing at Muir. We watched the clouds rip over Rainier from the south. 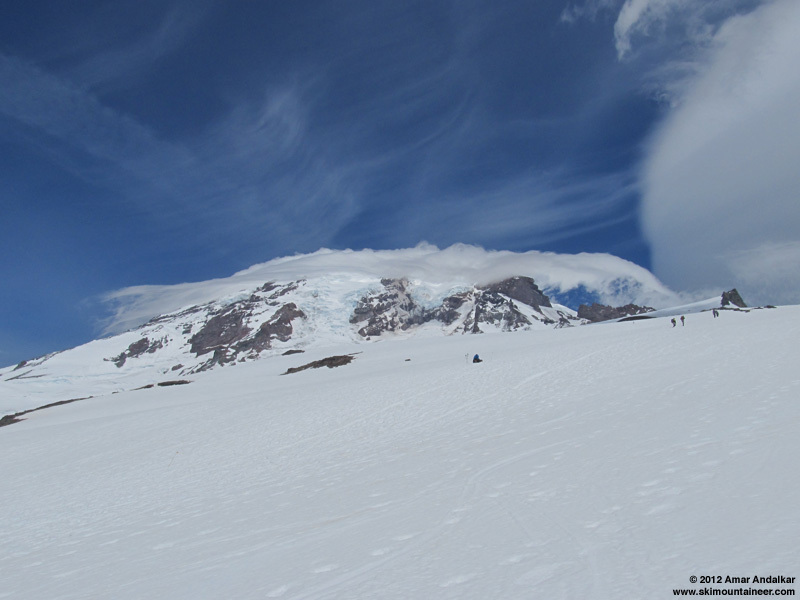 In under a minute the the top 4000 feet of Rainier went from blue skies to complete whiteout. Thanks for taking a picture of my tracks......and where I skied that day it was memorable one besides the extra walk on the road from the Jackson Center to Mazama Ridge area. 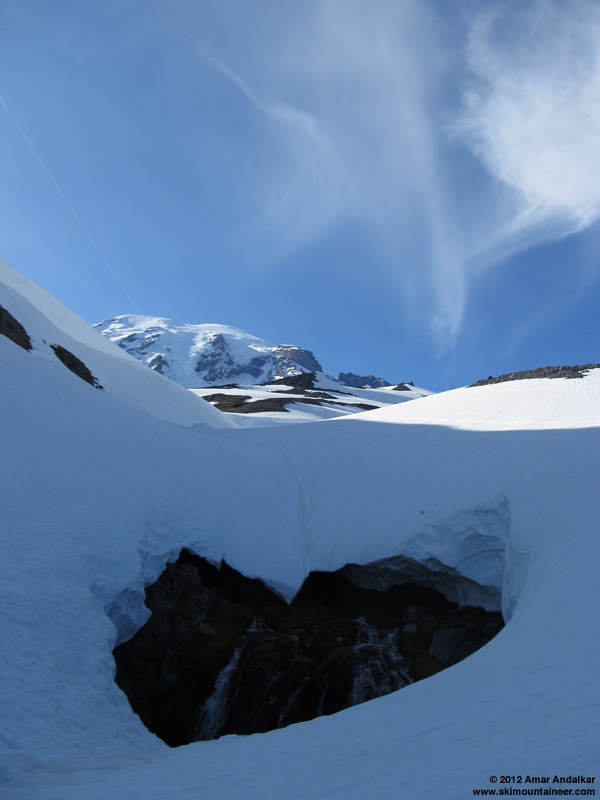 I was concerned about crevasses so I traveled up the way I descended.